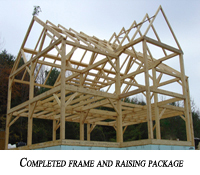 Frame only Package: A package from Groton Timberworks can include various combinations to meet the demands of each individual client. The simplest of these would be a frame which is precisely milled, planed, machined, sanded and neatly organized to be picked up at the shop in Groton, VT. This FOB (freight on board) transaction would then require the homeowner or contractor to assemble, raise, and enclose the frame. Groton Timberworks would simply cut the pieces in the frame and supply all fasteners (oak pegs) for the assembly process. Once the frame is loaded onto a trailer at the shop, the contractor would complete the project from raising to completion. 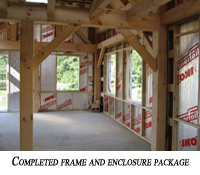 Frame and Raising Package: Another package option is to have Groton Timberworks cut the frame and then erect it on the homeowners building site. Groton Timberworks has erected hundreds of frames, ranging from small sheds to frames which are built with over 800 pieces. The erection of any frame is a large task, but the experience developed over 20 years allows Groton Timberworks to safely and efficiently erect our own frames. Each job site is different, and therefore dictates what equipment will be needed to raise the frame. We may only need to use our 32 foot, 6,000 pound forklift to erect the frame, but if necessary will use a crane to safely complete the raising.The use of this equipment is included in the package price. After the frame has been raised on the jobsite, it will be the responsibility of the homeowner or general contractor to complete the project, starting with the installation of the enclosure system chosen by the client. Frame and Enclosure System Package: Groton Timberworks will carefully cut, deliver and erect the chosen timber frame, build and deliver the wall panels, and install the insulated roof and high efficiency wall systems.. This approach to building has countless benefits. The biggest benefit is dealing with a single company to ease communication between all parties involved in building of the structure. Whether you are looking to build yourself or have a general contractor work with you, Groton Timberworks will work closely with you and your contractor to ease the process of building your personal timber frame. Once your frame has been erected, the same crew that designed, constructed, cut and erected your frame will apply the wall and roof enclosure systems to the frame. After the crew has completed installation of the enclosure systems your home will be water tight, ready for exterior trim and to have the final roofing material applied. Windows and doors can also be quickly installed. Copyright © 2015 Groton Timberworks, Inc. All Rights Reserved.